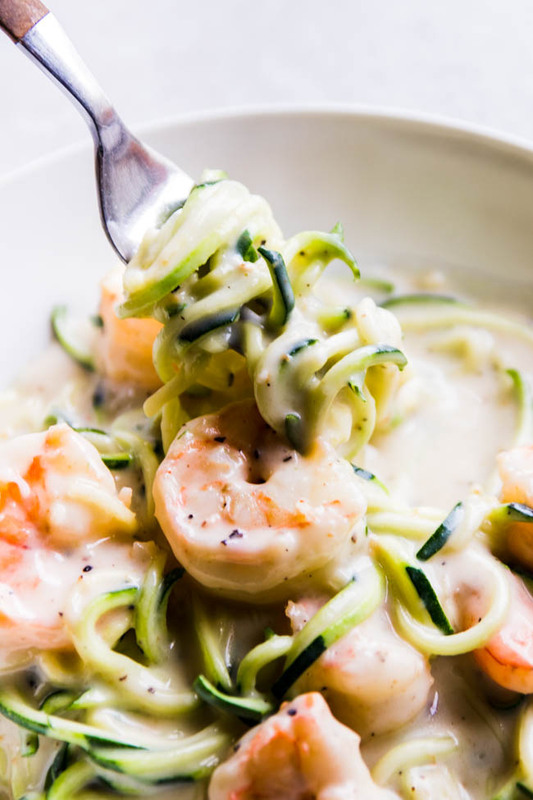 Lighten up your favorite shrimp alfredo recipe with this easy zucchini noodle twist! Ready in 20 minutes and under 400 calories! This post contains affiliate links: if you buy something I’ll earn a small commission at no cost to you. This post is sponsored by my friends at Wild American Shrimp. I am officially ONE HUNDRED AND FIFTY PERCENT on this zoodle noodle bandwagon. I’ve been a teeeeensy bit obsessed with zoodles (that’s short for “zucchini noodles,” if you’re like me and exactly zero percent hip to anything. I may or may not have had to Google it) ever since I caved last year and finally bought a spiralizer. And okay, I’m usually vehemently against any kitchen products that have just one use, but honestly? This spiralizer is MAYBE the best thing I’ve bought in years. Pasta and I are basically soulmates, so the fact that I can “eat spaghetti” without actually, you know, EATING SPAGHETTI is kind of amazing. But let’s talk about this shrimp alfredo recipe! Since I jumped on the zoodle-noodle bandwagon, I’ve stuck mostly to lighter sauces like pesto or a quick bolognese. But it was really only a matter of time before I gave it a whirl with something cheesy. Liiiiike, for example, this garlic parmesan cream sauce (<– because OMG). I was a little on the fence about whether zucchini noodles would hold up to a heavier sauce, but these vegetable noodles DID. NOT. DISAPPOINT. The zoodles stayed firm and twirl-able (which, twirlability = 90% of the fun with real spaghetti, yes?) and kept this heavier sauce feeling light and summery. Also, let’s dole out some bonus points for this recipe being 1) ready in 20 minutes and 2) clocking in at under 400 calories per serving. 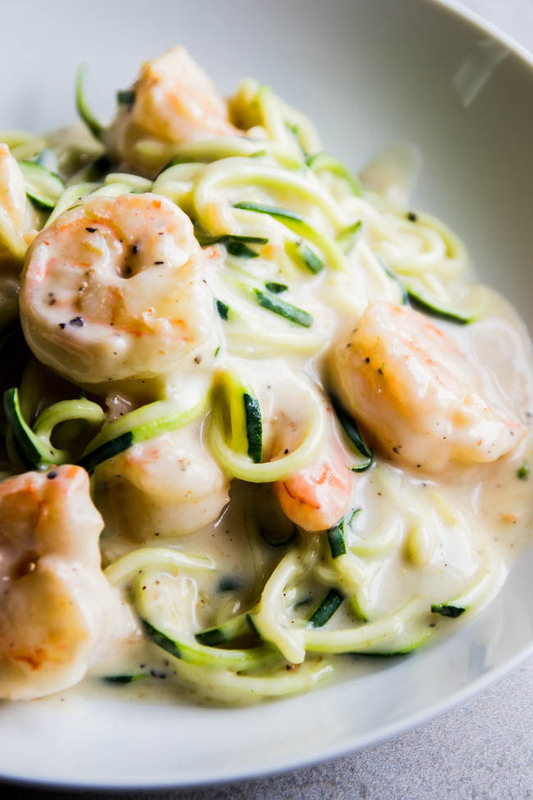 Hip hooray for zoodle shrimp alfredo! ALSO also, don’t forget to look for Wild American Shrimp when you’re shopping for recipe ingredients (which I know you’re totally about to run out and do, because helloooooo, we basically just turned shrimp fettuccine alfredo into health food). You can read more about why I choose Wild American Shrimp in this post, but here’s the short version: It’s sustainable, shrimpers are awesome, YAY for supporting local family fishermen, and BOO to the serious slave labor issues plaguing the foreign shrimp supply chain. But seriously. That running-out-for-ingredients thing we just talked about? Do it. Do it nowwwwwww. An easy healthy shrimp alfredo recipe. 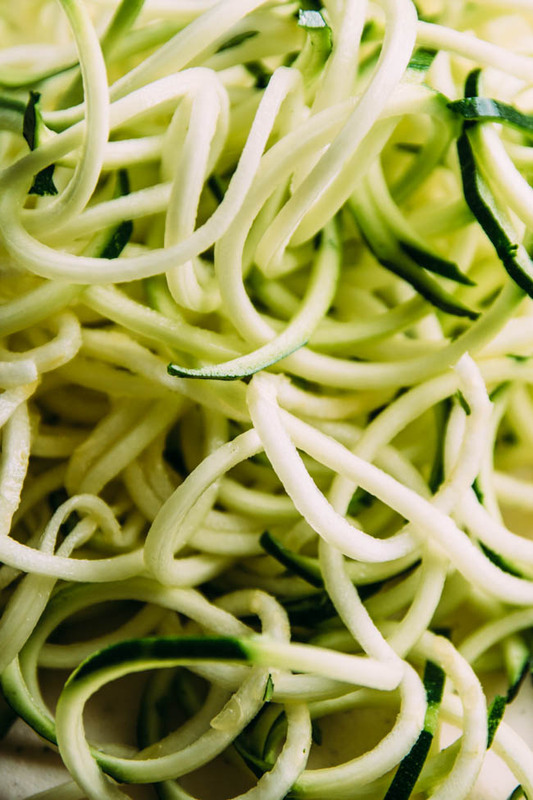 Spiralize the zucchini into zoodles (see recipe notes). Set aside. In a large skillet over medium heat, melt half of the butter. I like to use a large flat-bottomed skillet like this one. Add shrimp to skillet and season with salt and pepper to taste. Cook, stirring occasionally, for 4-6 minutes until shrimp are just cooked through. Remove shrimp from skillet and set aside, leaving any remaining butter in the pan. Keep the skillet over medium heat and add the remaining butter. Stir to melt. Add garlic to skillet and cook until fragrant, about 1 minute. Keep an eye on the butter while the garlic cooks – reduce the heat to low if the butter starts to brown too much. Add flour to skillet and stir to form a roux. Let cook for 30 seconds or so. Add milk to skillet a little at a time, stirring constantly to break up any lumps. I like to use a whisk here. Let the sauce thicken, whisking occasionally, over medium heat until it’s thickened considerably, about 5-7 minutes. You want a THICK sauce here – almost to a custard or pudding consistency – because when you add the zucchini noodles, they’ll release quite a bit of moisture and the sauce will naturally thin out on its own. Remove sauce from heat. Stir in parmesan cheese and salt and pepper to taste. 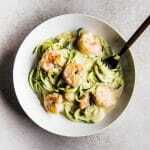 Add zucchini noodles and cooked shrimp to sauce and toss to combine. The sauce may seem thick at first, but that’s ok – let it sit for a minute or two to let the zucchini release some water and then give it a final toss before serving. 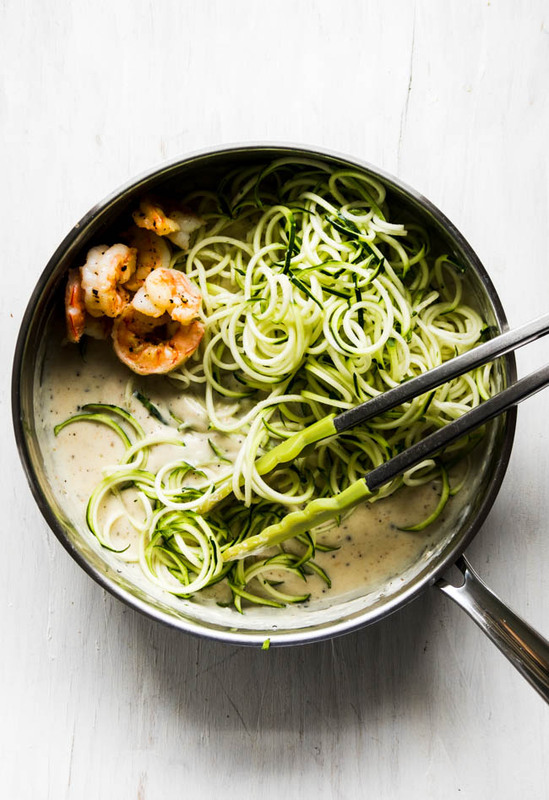 Watery Zucchini Noodles: You’ll notice that the sauce for this recipe gets really thick, and it doesn’t look like there’s a whole lot of it at first. 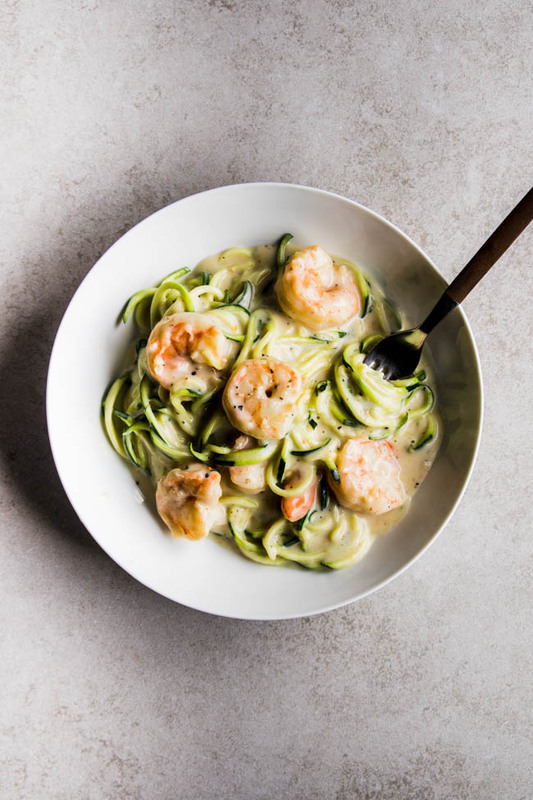 When zucchini cooks, it releases a lot of water – so when you add the zucchini noodles to the sauce, that water will release and naturally thin out the Alfredo to the consistency we want. If you’re worried about the zucchini getting TOO watery, you can hit it with some salt and set it in a colander for 15 minutes or so to draw out some of the moisture, and then proceed with the recipe. You could also cook the noodles in a separate skillet, drain any liquid, and then add them to the sauce. Look for wild-caught American shrimp when you’re buying shrimp for this recipe. You can read more about why it’s best to buy Wild American Shrimp in this post. (The short version: sustainable fisheries, support local shrimpers, avoid shrimp processed with slave labor). If you substitute real pasta for the zucchini noodles in this recipe, I recommend doubling the sauce or adding a large splash of pasta water to the recipe as written to thin out the sauce. Add broccoli, peas, asparagus, peppers, or any other veggies you have on hand to this recipe! 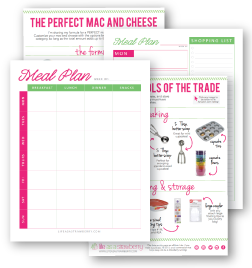 It’s a great blank-canvas recipe for those clean-out-the-fridge nights. 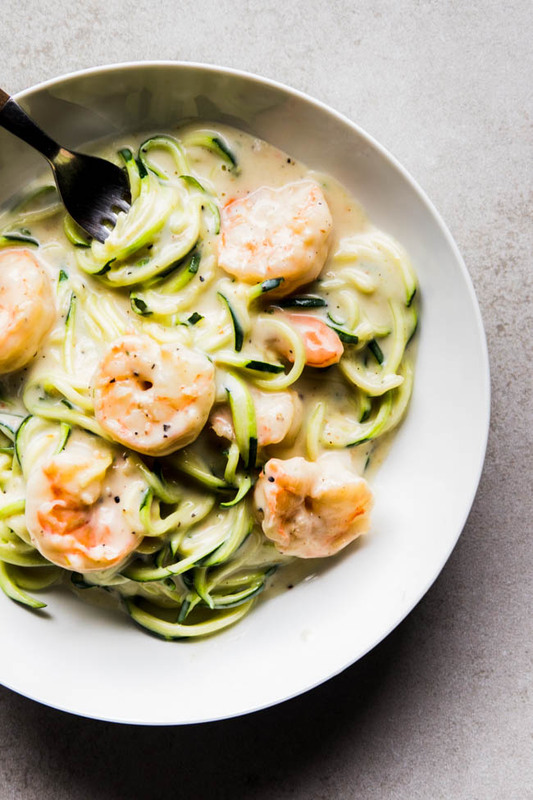 Zucchini noodles do NOT keep well once they have sauce on them, so plan to eat this all in one sitting or save zucchini noodles separate from any extra sauce if you want leftovers. Not a zoodle fan? Use half zoodles and half cooked spaghetti if you like. at the table // full sail brewing co.
Hi Jessie, I tried this recipe last night and I must be missing something… the sauce was shaping up beautifully and smelled DELICIOUS! Then I added the zucchini and it looked great but the zucchini made the sauce cold. And it was still pretty raw/crunchy. I simmered it all together for about 5-8 minutes so the zucchini would cook a bit and it would all get hot, but then the sauce separated! The flavor was good but I’m so disappointed that it didn’t turn out better! Did I overlook a step in your recipe? How are you cooking your zucchini? I like my zoodles to be just barely warmed through so they still have the bite and texture similar to al dente pasta – so I don’t do any extra cooking before I throw them in the sauce! If you’d like them to be softer, you can sauté them for a few minutes in a separate frying pan until they reach a texture you like and then add them to the sauce. Sauce like this does tend to separate if you keep it on the heat after you’ve already added the cheese, which is why I suggest removing the pan from the heat before stirring in the parmesan. I let the zoodles and sauce sit together for a few minutes (off of the heat) to warm the zucchini through, and that usually achieves the texture I like in my zucchini! If you want to soften the zucchini more, I definitely recommend cooking it separately first rather than cooking it longer in the sauce to avoid any separation. I hope that helps!